This store bought costume for groups entered our 2015 Halloween Costume Contest. 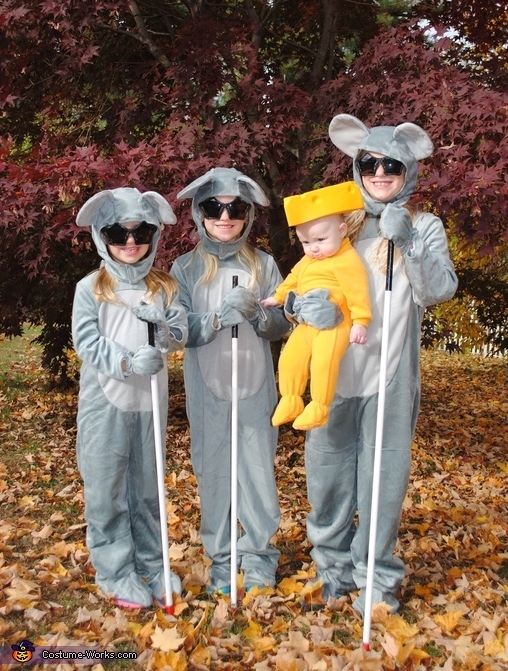 London (4), Brittyn (6), and Rowan (7) are featured as 3 Blind Mice. They're wearing store bought mouse costumes (Halloween Costumes), with star shaped black sunglasses (Party City), and eye sticks made from materials bought at Lowes. The Cheese is Hudson (3 months) and her cheese head hat is from Amazon with a yellow onesie from Footed Pajamas. The girls wanted a family costume and thought this was the best idea this year.